If you’re looking for a special kind of treasure hunt, make it a quest to rest your head in the many yurts tucked within the Colorado backcountry. Nomadic tribes of central Asia first crafted yurts hundreds of years ago to use as portable shelters as they followed their herds. It turns out, they were on to something. These round, tent-like structures offer a magical place to spend the night. There’s nothing quite like lying in a toasty bed, wood crackling in the stove, as you gaze up at a spiral of ceiling beams that meet at a skylight dotted with stars. When morning comes, rub the sleep from your eyes, throw on a pot of coffee, and greet the crisp mountain air on your private hillside, surrounded by wilds that call you to explore. 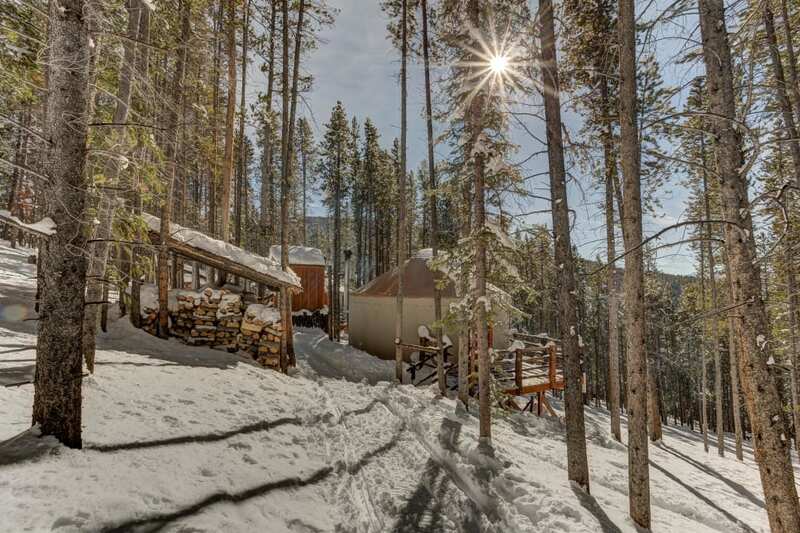 The woods of Colorado are sprinkled with rentable yurts that range from simple to stately. 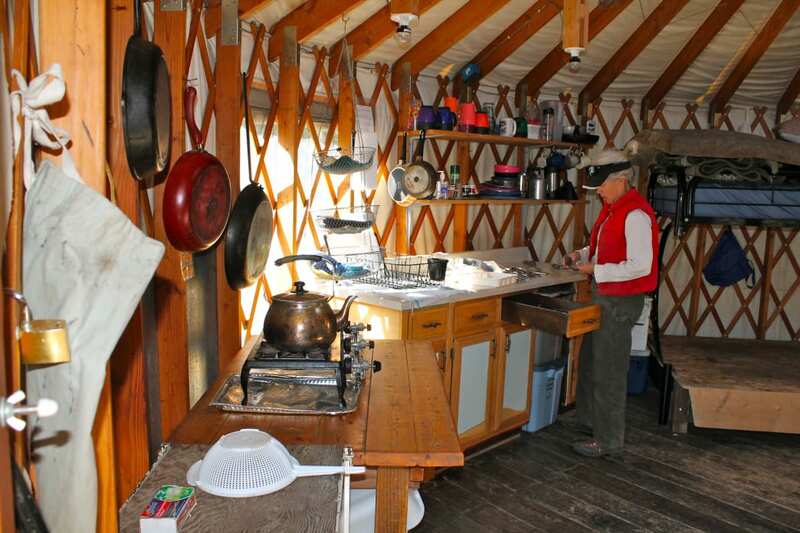 Unlike Colorado’s backcountry huts, with yurts, you get the whole place to yourself. Most yurts sleep six, and come stocked with woodstoves and firewood, propane cook stoves, cookware, and beds with mattresses and pillows. (Tennessee Pass even provides bedding.) Be prepared to haul water from a stream and treat it, or melt snow in the winter. Bring a flashlight for navigating to the outhouse at night. Some yurts have lights, some don’t. Keep in mind that winter backcountry travel involves avalanche risk. Get trained in avalanche safety, and bring beacons, shovels, and probes. You’ll have to leave Fido at home. Dogs are prohibited in the winter in order to keep the snowmelt pure. Nine miles west of Leadville, the Tennessee Pass Sleep Yurts come in at the swanky end of the spectrum, with comfy log beds, down comforters, fresh drinking water, and oodles of other creature comforts. If you’ve never ventured into the backcountry overnight, this is a great place to start. Four yurts are nestled in the woods just 1.3 miles from the trailhead. The folks at Tennessee Pass will even haul your bags, so you barely have to break a sweat—unless you opt to explore the 15+ miles of groomed snowshoe and Nordic ski trails on the property. The yurts come stocked with cookware and dishes, but if you don’t feel like cooking, don’t despair. Just meander one-third of a mile down the trail to the Tennessee Pass Cookhouse—a fine dining restaurant where you can tuck into a gourmet four-course dinner. It’s also open for lunch on weekends. If you can’t break away from your cozy abode, order catered meals delivered to your door (breakfast year-round; dinner in winter only). Then throw another log on the fire. The Tennessee Pass Cookhouse is also open to those who aren’t staying overnight. It’s just one mile up the trail from the road. Call ahead for reservations. The Tennessee Pass Sleep Yurts rent for $225 per night and sleep up to six people. Dinner at the cookhouse is $85 per head, which includes a headlamp and skis or snowshoes to get you there. Plug Colorado State Forest State Park into Google Maps and you’ll see its claim to fame right next to the pin : "Enormous park featuring moose and yurts." This state park encompasses 71,000 acres of stunning mountain scenery just over Cameron Pass 75 miles west of Fort Collins. Never Summer Nordic Yurts operates seven yurts in the park and four just outside the borders, one-quarter to three miles from the road. Alpine bowls and ridges beckon backcountry skiers and riders in the winter. Hiking, mountain biking, and fishing provide plenty of summer fun. You’ll need a flashlight, as there are no lights in the yurts, although a lantern is provided. The Never Summer Nordic Yurts rent for $80-120 per night and sleep four to nine people. You’re welcome to cram three more people on sleeping pads on the floor, but that makes quarters pretty tight. This rustic yurt—open weekends and holidays from Thanksgiving until the end of April—is nestled in Roosevelt National Forest off Peak to Peak Highway 16 miles south of Nederland. The two-mile approach crosses no hazardous snow areas, so this is a good yurt for those who lack avalanche training. Note that part of the route is often blown clear of snow, so be prepared to take off your skis or snowshoes for a spell. 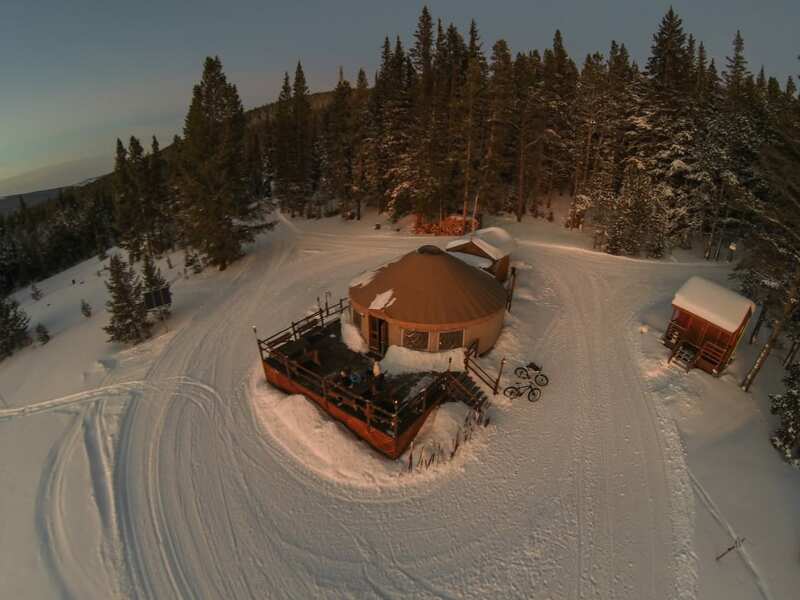 Use the James Peak Yurt as base camp for snowshoeing, or ski 45 minutes to Jenny Lind Gulch, where mellow, open slopes give a great taste of backcountry skiing for beginners. (Avalanche training recommended.) When night falls, fire up the propane lights and amuse yourself with the yurt’s collection of books, magazines, and board games. Then tuck into your sleeping bag when the day’s adventures cause your weary eyelids to droop. 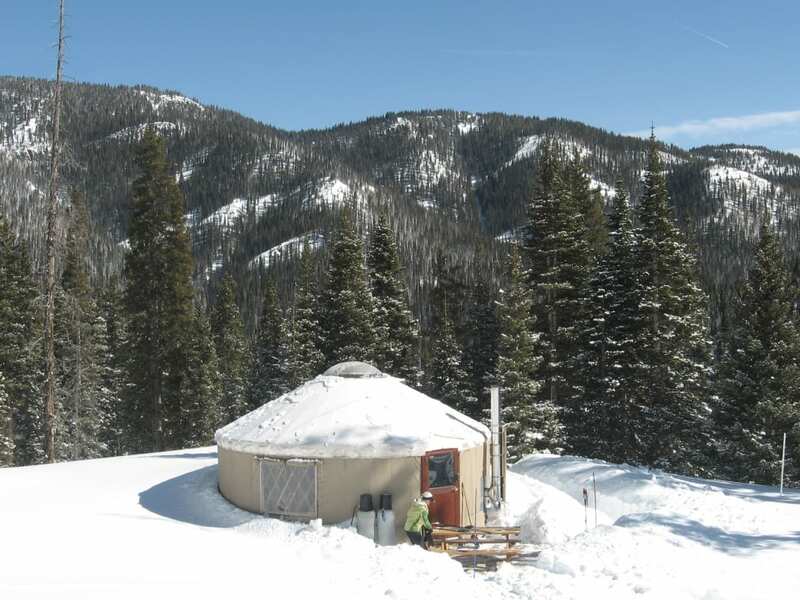 The James Peak Yurt costs $175 per night and sleeps six. 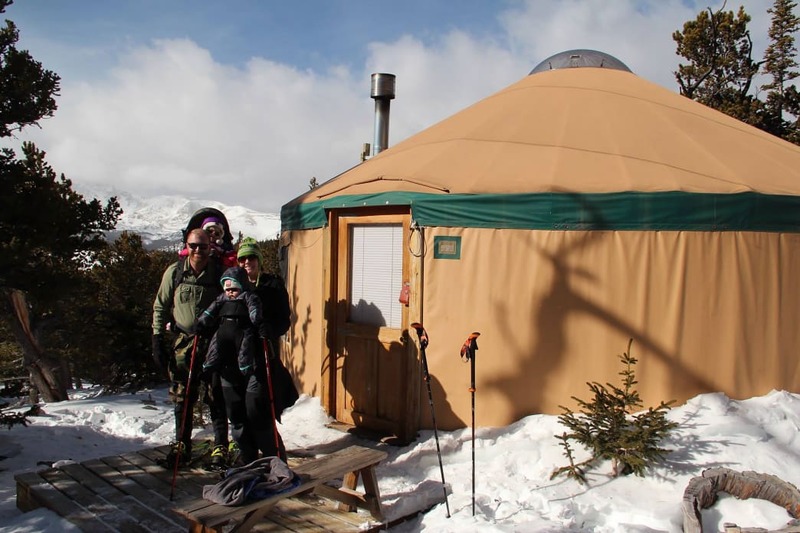 The Emma and Marceline yurts just outside of Leadville offer high-alpine living at 12,000 feet. It’s a healthy five-and-a-half-mile trek up, climbing 1,200 feet, so make sure your legs and lungs are primed for adventure, and your backcountry skills are in top form. Once you settle in, channel your inner lumberjack and split logs for the woodstove. (Flannel shirt not provided.) Play cards (provided) by the light of the gas lantern. Thousands of acres of public land out the door promise mountains to climb, bowls to ski, and breathtaking vistas. In the summertime, you can drive a high-clearance four-wheel-drive vehicle right to the door. 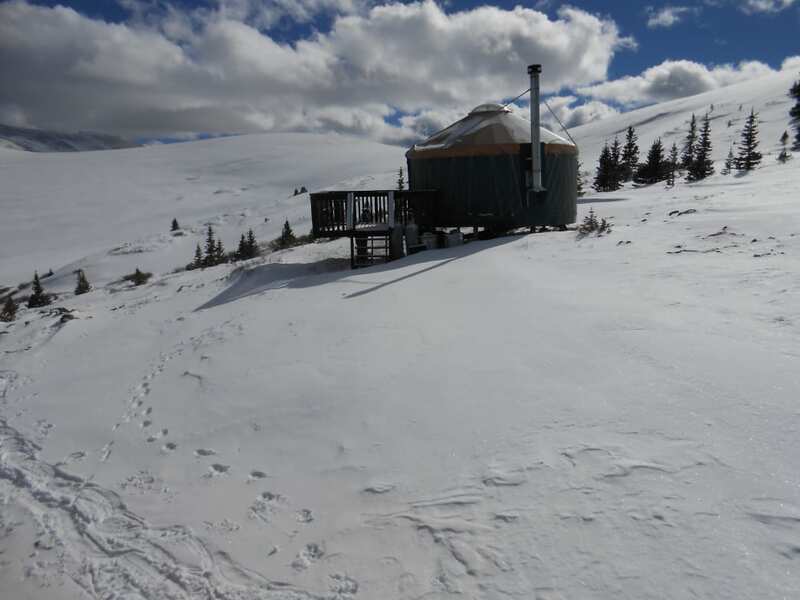 The Leadville Backcountry Yurts range from $85-115 per night, depending on season, and sleep five. Run by Wolf Creek Backcountry, the Pass Creek Yurt sits just below the Continental Divide at 10,250 feet in the San Juan Mountains in southern Colorado. 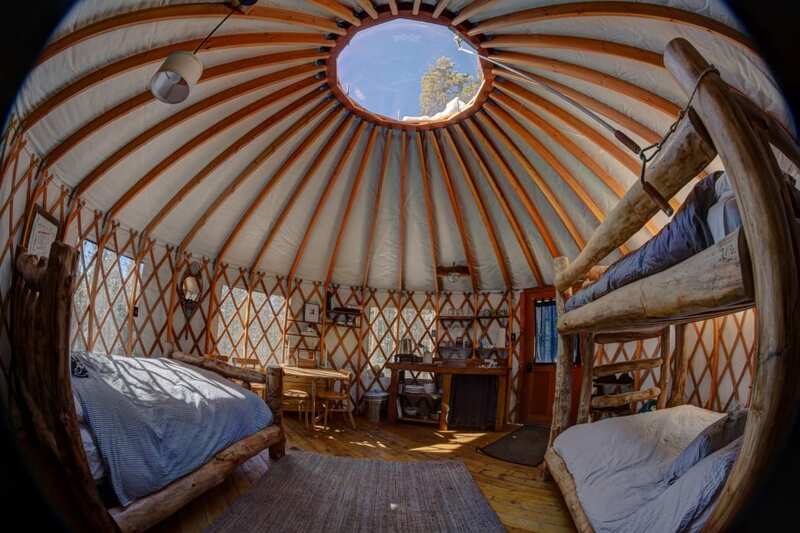 It’s a one-mile bike or hike in the summer, or a three-mile winter ski to get to this yurt, which comes complete with hut shoes and astounding views. In the summer, bed down in the yurt by night, and explore the Continental Divide Trail by day. In the winter, heavy snow and challenging terrain can keep backcountry skiers busy for weeks. 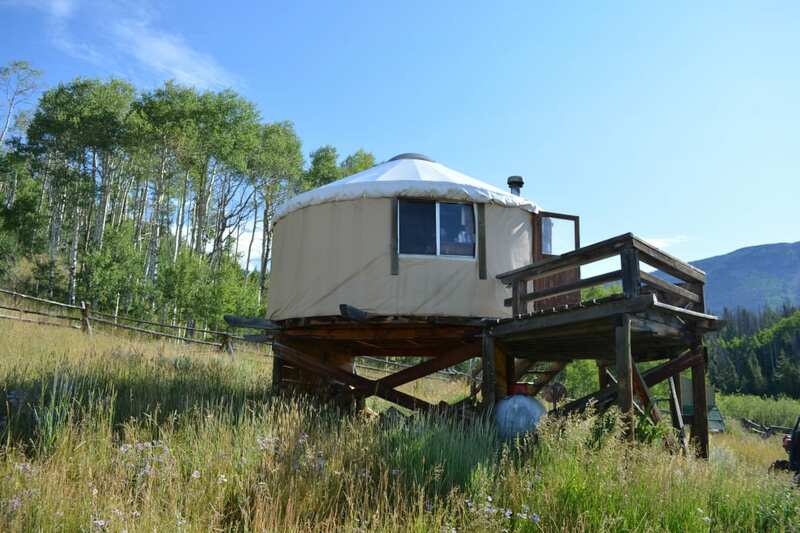 The Pass Creek Yurt costs $119-169, depending on the month, and sleeps six in bunk beds.